Black Onyx, an elegant stone, is the focal point of this beautiful line of jewelry now carried by Laser Xpressions. 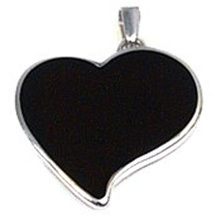 The Black Onyx Heart Pendant, set in Sterling Silver, is perfect for laser engraving small text or photographs � this is a wonderful gift for any occasion. Black Onyx will laser engrave a white color, providing excellent contrast.